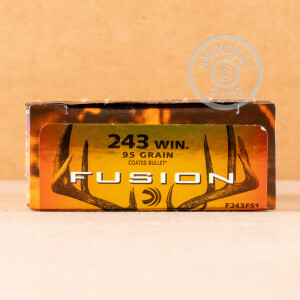 This .243 Winchester ammunition from Federal's Fusion series is a sure bet against small to midsize game such as coyotes and deer. 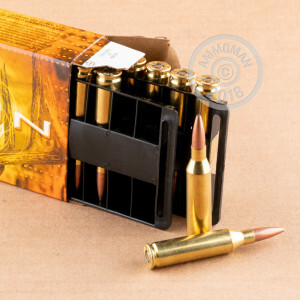 Each cartridge in this box of 20 fires a 95 grain skived tip soft point bullet at a muzzle velocity of 2,980 feet per second. 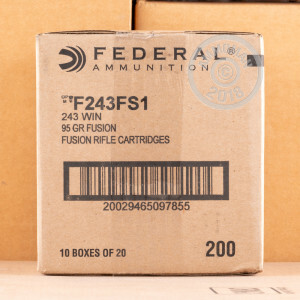 Federal Fusion bullets get their name from their molecularly fused jacket and core, which provides a high level of weight retention and therefore superior expansion and penetration.